February is Black History Month, a month to pay “tribute to the generations of African Americans who struggled with adversity to achieve full citizenship in American society.” As a church historian I am particularly interested in paying tribute to those African-Americans and others of African origin who played a major role in the story of the Christian Church. There are many who have done excellent work in telling the story of early African-Americans who contributed to American Christianity: leaders like Absalom Jones and Richard Allen, and early African-American Presbyterian leaders like John Gloucester. My interest in church history though lies further back in the annals of time. I’m a medievalist and I also dabble in the early church period. I have been encouraged at the increased awareness of just how many of the early church Fathers were African: Athanasius, the staunch defender of Nicene Orthodoxy, Augustine, the Schoolmaster of Western Christianity, Cyril of Alexandria, Origin, Cyprian of Carthage, Tertullian… I could go on. I was encouraged to see an article recently that highlighted this wonderful history as a part of a series of posts on Black History Month on the Reformed African-American Network. The medieval period, however, has often been seen as a time without much contribution from Africans to the life and work of the Church. Part of that is due to the spread of Islam over North Africa. Part of that is due to our ignorance in knowing and telling the stories of African Christians during that time. Yet, as I was reading the article linked above I remembered one particular African who had an enormous impact on medieval Europe: Hadrian of Carthage. Hadrian, also known as St. Adrian of Canterbury, was like St. Augustine a North African of the Berber people. He was born in Carthage in the early to mid 7th century, and classically educated. He later moved to Italy and became an abbot of a monastery near modern day Naples. Bede describes Hadrian as, “a native of Africa, very learned in the Scriptures, experienced in ecclesiastical and monastic administration, and a great scholar in Greek and Latin,” (HE IV:1). That’s a pretty impressive endorsement by Bede! Because of his experience and erudition, Hadrian was impressed upon two separate times by his friend Vitalian, the Bishop of Rome, to take the vacant see of Canterbury and engage himself in a much needed reformation and revival in the English Church. Twice though Hadrian turned him down, the last time recommending another monastic leader, one Theodore of Tarsus. Theodore accepted the appointment, but the Pope insisted that Hadrian go along, ostensibly, to show Theodore the way through Gaul to England. Yet it was not travel directions that the Bishop of Rome truly desired Hadrian to give, but to be a partner to Theodore in the reformation and revival of the English Church. Theodore and Hadrian set off for England in 668, after a brief pause for Theodore to grow his hair out so as to be able to accept the Roman form of tonsure. They arrived in England in 669 and began visiting the churches so as to ascertain their state and begin the needed education and reform. They began to attract students whom they instructed in the knowledge of theology, church customs and rites, sacred music, Greek and Latin, and the study of sacred Scripture. Bede describes a renaissance of sorts in England that came as a result of their labors, “The people eagerly sought the new-found joys of the kingdom of heaven, and all who wished for instruction in the reading of the Scriptures found teachers ready at hand,” (HE IV:2). This explosion of learning was such that Bede remarked a couple of generations later that, “some of their students still alive today are as proficient in Latin and Greek as in their native tongue,” (ibid.). Thus we can see that Hadrian’s impact on England and the church in England was massive. Yet what remains to be seen is just how much his contribution to the reformation and revival of England led to the foundations of Christianity in Western Europe. Western Europe in the 7th c. was still a largely unreached place. Catholic Christianity was established in some places, while others of the Germanic tribes had been converted to Arian forms of Christianity. Still others remained pagan. There was a great need in these Germanic areas for both evangelization and Christianization. The problem was that the existing churches of Western Europe (mostly in Gaul, modern France) were not equipped to undertake this mission. This is where the English came in. Due to the work of Hadrian and Theodore, the English were equipped to engage in this mission to the Germanic peoples. And so they did, with great vigor and success. Boniface led a wave of missionaries from England back to the continent to evangelize and establish churches. He is now known as the Apostle to the Germans. Educational leaders like Alcuin of York were brought from England by the Carolingian rulers to help establish court schools as well as cathedral and monastery schools and to lead in the Christianization and reform of the churches in Western Europe. The legacy of these English missionaries is hard to overstate: these are the fathers of the Europe we know today. They established the institutions and infrastructure upon which Western civilization is established. And none of this would have been possible without the efforts of St. Hadrian, the African. A medieval giant who had a greater impact than any of us probably realize. Let us give thanks for St. Hadrian and celebrate his work and ministry and its vast impact on the world we live in. I’m a listener. I do not like to speak too quickly. Call it wisdom. Call it caution. Call it what you will. It’s the way God made me. I’ve been listening over the past three days. I’ve been mourning. I’ve been angry. I’ve been numb. But I’ve been listening. I’ve been listening to my LGBTQ friends. I’ve been reading their posts and the articles they’ve shared. Friends, I’ve been listening, and I’ve heard you. When news of the Orlando Massacre began to come out and I became aware of it Sunday afternoon, I wanted to say something. But I also did not want to seem like an opportunist capitalizing on a horrible tragedy. I am cognizant that as a straight white Christian man that I didn’t necessarily have an invitation to speak. I didn’t want this to be about me, because it’s not. It’s about the dead. It’s about the injured. It’s about their families. And it’s about every LGBTQ person in this country who lives in a constant state of fear. But I’ve heard the voices of my friends. And they need their straight allies to speak. So today, while I’m still listening, I’m now speaking. LGBTQ friends, I mourn with you. I am angry with you. I love you. I acknowledge that this massacre was an act of hatred against LGBTQ persons. I utterly condemn all acts of violence against LGBTQ persons who are targeted for being Gay. I condemn bullying LGBTQ people. I condemn making fun of LGBTQ people. I condemn shunning and shaming LGBTQ people. I hope the church can be a place of safety for you. A place where you don’t have to be afraid. A place where you don’t have to be on your guard. A place where you can be you. That’s what I hope, but I know that realizing that hope will be messy. It won’t be easy. But I truly hope that for you and for us, because we need you. I realize that for many of you the church has been anything but safe. I realize that the last place many of you would go for safety would be a church. I also realize that there are many of you already in the church who love the Lord and are afraid of opening up to the church because you don’t know what will happen. I lament all of this. I repent of the ways I have contributed to it. So, for Christian people reading this, we have a job to do. Let us affirm what scripture clearly teaches us to affirm about this tragedy. All people are made in God’s image. God loves every person that he has made. Do not murder is one of the top ten rules on God’s list. Bullying, attacking, mocking, shunning and shaming are all lesser forms of murder. Jesus was not afraid to enter into all kinds of places and love people for who they are. Jesus accepted people that society shunned, shamed, mocked, and stoned to death. So let us weep with those who weep. Let us condemn violence against LGBTQ persons. Let us not mix in our moral or theological opinions during this time. Let us not talk about gun rights (on either side) during this time. Let us refrain from defending ourselves during this time. Let us simply grieve, love, listen, pray, and serve. What are some ways to serve? You can donate blood to a local blood bank. You can donate time or money to a local charity that serves at risk youth that have been made homeless because they are Gay. You can be a compassionate voice in defense of those who are suffering injustice. You can listen and learn from your LGBTQ friends. Trust me, you have some. Pray for those friends and for all LGBTQ people. Pray for their safety. Pray for their comfort and healing in this time. Pray for the families of the dead. Pray for the healing of those survivors. LGBTQ friends, God loves you, he doesn’t hate you. He made you in his own image. You were fearfully and wonderfully crafted by Him. Jesus weeps at this tragedy. This is not the way things were made to be in this world. Here is a transcript of the speech that Rev. 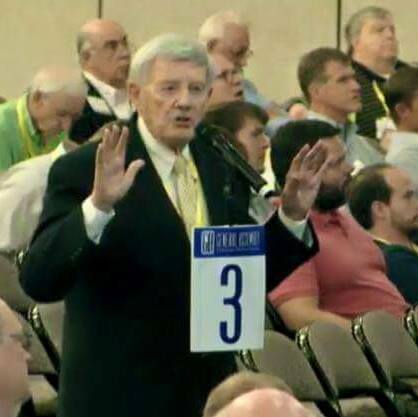 Jim Baird, former Senior Pastor of First Presbyterian Church, Jackson, MS, gave on the floor of General Assembly in support of the personal resolution on Civil Rights. Mr. Moderator, Jim Baird, Mississippi Valley Presbytery. In 1971 twelve men were elected to form a new denomination. Take two years and form that denomination. Of those twelve men six were ministers and six were ruling elders. All have died or left the PCA except two: Kennedy Smartt and Me. And I confess, that in 1973, the only thing I understood was that we were starting a new denomination, which we did. And I confess that I did not raise a finger for civil rights. I was taught (sic) with one thing, and that was to start a new denomination, for the sake of the scripture, for the sake of the preservation of historic Presbyterianism, and for the furtherance of the gospel proclamation. And so I confess my sin. I’m not confessing the sin of my fathers, I’m confessing my sin, and of those twelve men. Were we racists? No. But we did not do anything to help our black brethren. That’s the first thing here. The second thing, fifty years later I’m a different man, but that’s beside the point. It was my understanding that this resolution would have been passed here and would have been passed with the understanding that we confess, you men, but I confess personally that I did nothing. But the idea was that it would be sent down to the local churches. What you do here is not going to affect anything at the local church, unless they have a chance to represent themselves. And it seems to me that we oughta say that we made a mistake. We confess our sins. I don’t believe there’s anybody here who hasn’t said I got problems one way or another with the racial problems in the United States. We got a problem. OK. But we oughta do something. We’re looking for a resolution. And I just assumed that we would have the resolution, and by the way it comes from Mississippi. Two men from Mississippi. And it is also my conviction that we’re never going to solve the problem among us, not in Baltimore, or in Chesapeake or in any other place, or in Chattanooga – it’s gotta be done in Mississippi. And there are some of us who are trying. But if we go back and go to every single congregation in the PCA and ask the Session of that church and the Deacons of that church to bring it before their own and decide themselves what have we done in forty years, and what should we be doing today – and take it to every single congregation, and then take it to the presbyteries, and then bring it to the next General Assembly. And that’s what I thought this was all about. Have I been wrong, Mr. Moderator? I don’t understand. Why don’t we take this thing and just say, the resolution – and that’s how I think the resolution ends, I don’t have it in front of me. But I think the last thing the resolution says is to take it back to your local church, and have your local church deal with it. Every single denomination [sic – congregation]. And can you imagine what it would mean to have a whole denomination to work on that one issue – that’s what I thought it was all about. And that’s what I would propose. [Mr. Wert: Thank you, brother Baird.